Yes DNA! UA hasn't collected any DNA yet, but is reserving the right to do so. Making this a requirement of the hiring process could have a real chilling effect on academia. Is this an isolated incident or a disturbing trend? Imagine a young educator, just out of grad school, with huge student loans. Given the choice of submitting a DNA sample and getting the job versus maintaining their privacy and remaining out of work - which would they choose? It's true that the University of Akron's DNA-testing policy isn't designed to weed out potential employees with, say, a gene linked to breast or prostate cancer that could make them more expensive to insure -- which is what [the 2008 Genetic Information Nondiscrimination Act's] drafters were most concerned about. Instead, the school's ultimate purpose is the more conventional one of a criminal background check. That doesn't matter, says Jeremy Gruber, president of the Council for Responsive Genetics in New York City. 'GINA specifically prohibits employers from requesting or requiring genetic information,' Gruber says. [...] Gruber believes that, in theory, there may be a way for the Akron administration to implement its policy in a way that complies with GINA: 'If the university had sufficient handling safeguards to demonstrate that they were collecting biological samples and sending the entire sample on to the federal government for testing without taking any steps to analyze the sample they might not be in violation of GINA.' But, he adds, if the FBI relies on fingerprints for background checks, why is a DNA sample necessary? Wow, that's an amazing number of dropouts per day. Number of students, on average, who drop out of high school every day. 1.3 million drop out each year. Looks like a great project for my wireless class. Connectify.me is a new service we just found out about. 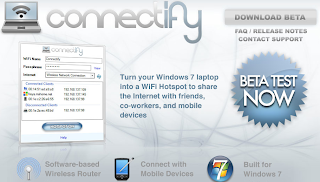 They've sussed out how to make any Windows 7 computer into a WiFi hotspot. Installation is simple. Go to the website, click the big, shiny button, run the .exe file, follow the prompt. You'll then see a Connectify logo in the notification tray. It's party time! Choose a name, set up a password, and click the big, shiny button. Congratulations. You're now a software-based wireless router. It took about five very obvious clicks and was truly so easy a caveman could do it. These aren't in production yet, but these would be so cool for entertaining or for gifts. Russian designer Natalia Ponomareva has developed an origami bird tea bag concept, designed to expand as the tea steeps. While not yet in production, Ponomareva has expressed interest in making the concept available for commercial use. Many colleges have contingency plans to move classes, students, and faculty online should there be a significant H1N1 outbreak. While most consider issues such as ramping up capacity in online learning systems and training more faculty to teach online, I doubt many consider that this crush in online learning could bring the Internet to its' knees. A report released by the US Accountability Office said that if 40% of employees and students were at home sick, there is a high likely hood they will be on the Internet, hence causing broadband congestion. While 40% of the workforce being affected by H1N1 may seem ludicrous, the government agency suggests precautions, like slowing data transfers in order to fuel financial markets and security networks, may be necessary if such a scenario were to happen. It's hard to believe the Internet is already 40 years old. Today, as you check your e-mail, tweet, surf, or shop, think back to what the world was like forty years ago, when the Internet was just an idea. Also consider the commitment this country had (40 years ago) to funding research and development in science, technology, engineering, and math. If the collective we (citizens, President Obama, and Congress) could renew that commitment, imagine what the next forty years could bring! On Oct. 29, 1969, UCLA student Charles Kline sent the first message over the ARPANET, the computer network that later became known as the Internet. Though only the 'l' and 'o' of his message ('login') were successfully transmitted, the interactive exchange ushered in a technological revolution that has — as anyone alive long enough to witness the shift knows — revolutionized human interaction. 'This ARPANET experiment that we're essentially celebrating right now, while it's not the Internet it is certainly one of the foundations of the Internet,' said Vinton Cerf, vice president and Chief Internet Evangelist at Google. Cerf, along with Robert Kahn, Chairman, CEO and President of the Corporation for National Research Initiatives (CNRI), are considered the fathers of the Internet as they created the so-called TCP/IP protocol that allowed various independent networks to link up to form a network of networks, or the Internet. That was 40 years ago Thursday, and since then, the ability to communicate with others, share information and just be connected has drawn more than a billion people online. And so the ARPANET, and later the Internet, was both supported by and fostered innate human nature — the need to be social and share information. John Gruber nails the reason why it's so hard for everyone playing catch-up to the iPhone. Android 2.0, the soon-to-be-released Verizon Droid, and features like turn-by-turn directions in Google Maps should make things interesting. Competition, spawned by the success of the Droid or even the Palm Pre are important for this device category to continue to experience growth and most importantly innovation! You know who thinks the iPhone 3GS stinks? Steve Jobs. No one is working harder on an ‘iPhone 3GS killer’ than Apple. Well the above, from Signal Theorist, is the Roomba coverage over a half an hour. A camera was setup, the lights were turned off, and the above is a long exposure shot of the Roomba's path. Not bad huh? The Boston Globe's circulation is down 18 percent in one year; the San Francisco Chronicle's is down 26 percent. The WSJ is actually stable. Steve Ballmer launches Windows 7 on the Today Show. No. 2: The amount of enterprise data will grow about 650% over the next five years, the vast majority of it unstructured, or not included in any database. No. 3: Green IT is about efficiency, prompting the business to ask 'how IT runs its shop and what they're spending' on energy. No. 4: A closely related trend to Green IT is what's called complex resource tracking, which gives you the tools to monitor energy consumption as well as automate energy usage to optimal levels. No. 7: More and more people are utilizing applications for mobile and wireless applications that are either free or modestly priced. No. 8: The energy cost of supporting a server will exceed the cost of the server in three years. It is helping to usher a 'build what you need' approach in the data center. No. 9: Mashups created by users are also something that IT has to manage. No. 10: Cloud computing, particularly a private cloud, separates users from the technology decision because it turns IT into a set of services. Nice preview of the Motorola Droid (on Verizon's network) from the Boy Genius Report. The Motorola CLIQ was a pretty big disappointment for me personally, but oh man does the Droid make up for it. Sure, there’s a little hype sprinkled in because this is the first Android 2.0 device I’ve had the pleasure of using, but once you move past the initial ‘wow’ factor, the Droid really delivers. Whether it’s Verizon’s ad campaign or Motorola’s that pits the Droid against the iPhone it doesn’t matter. The Droid isn’t an iPhone competitor because nothing at this point in time is an iPhone competitor besides the new iPhone. And things don’t have to be right now. Everyone can eat. So will the Motorola Droid be successful? Absolutely, we think. It will eat in to BlackBerry sales, Windows Mobile sales, and positively murder any lingering Palm Pre sales. It’s that good. Did you notice how Verizon still hasn’t announced the BlackBerry Storm2? Interesting quote from Jeb Bush - former Governor of Florida. I think the idea is a bit simplistic and impractical when applied to education - in a class of 30 you can't give everyone their own 'flavor.' In spite of that, I do think it leads to some interesting and maybe provocative thoughts and discussions. I have to admit this new MS Tablet looks pretty cool!